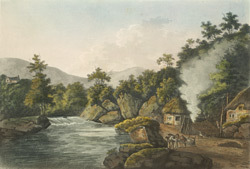 View of a charcoal kiln in Wales. The main uses for charcoal were in metal smelting, as a constituent in the production of gunpowder and to fuel blast furnaces in the glass industry. By the 19th century experimentation had resulted in the creation of coke which overtook charcoal in popularity and kiln’s like this one were demolished.